The Oak Stump after Branden pushed it back up with the tractor. November has been a busy month on the hill. With the help of Branden, a friend and fellow tree lover, I started the month by harvesting some trees that toppled over last winter due to the moist ground. 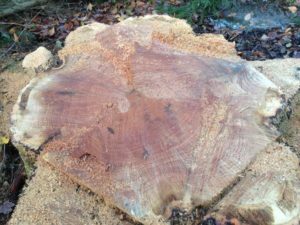 One was beautiful Red Oak – big enough that it would take two people to wrap there arms around it. During a quiet moment while Branden was waiting for me to arrive with one of the tractors, he counted the rings….approximately 115 I think he said. 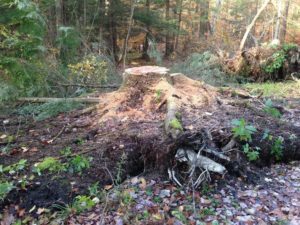 With it this mighty Oak took down a Maple, an Ash, and a couple of Hemlocks. We also harvested a Basswood that was left standing but damaged from the fall of the other trees in the grove. The day went well, other then my tractor getting a flat tire. As we headed out of the woods the challenges began. The dump truck filled with logs got stuck in the mud. We were quite committed as we tried pulling the dump truck with my truck to know avail, then with the other tractor. When that failed we tried to pull it out using both vehicles – without success. 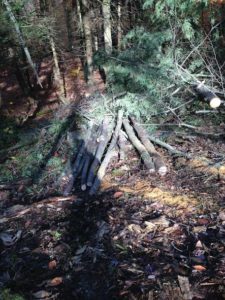 Finally after unloading all the logs and moving them out of the way – I pulled with my truck, and Branden pushed with the tractor and we dislodged the dump truck and reloaded it with the logs. Branden will mill the logs and then in a year after they have dried, the exciting part begins as I consider what projects around the camp the wood will be used for. The most immediate plan is for the Oak boards to become shelves for the new camp library. The weekend approached and much to my surprise a few folks registered for camping. A couple of really nice guys from York, England stayed in one of the Rustic Cabins for the night on their way to Niagra Falls, and another young adventurer came with her dog and set up her tent for the night. The guests at the Mountain Queen Cabin were the first to use the two person hot-tub that I recently acquired and repaired from a generous friend. With the frosts becoming more serious, I reluctantly turned off the water down at the camp and began the process of draining all the water from the lines and the shower house. But, not to worry – water will still be available for Late Fall and Winter camping, as I have ordered a “Flo-Jack” pump which will give winter campers access to water via hand pump. My gracious long-term camper friend, David has agreed to embark upon this task of assisting me with the installation of the pump once it arrives. There is so much more on the list for November – but my task is to somehow find balance – so off to physical therapy I go – to do some stretching and try to heal the stressed rotator cuffs in my shoulders. Then rolling a ball under my feet at night to ease the pain of the plantar fasciitis that has been challenging my mobility since this summer. There are so many wonderful moments that I feel so connected – and right where I am suppose to be. Like, when I first walked into the woods with Branden. We commented on how lucky we were to be able to spend a beautiful day in the forest with the trees. 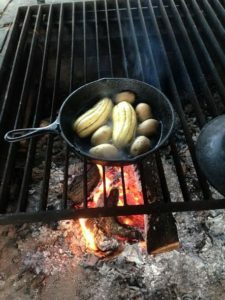 Or when I cooked my dinner over the fire using the potatoes and squash that somehow managed to grow this summer even though we had drought conditions. And last night, at 10 pm as I sat in the hot tub on my porch and looked up at the stars and moon and breathed in the cool air of the night. Although sometimes I push my body too hard and allow my mind to become over-whelmed with all the possible tasks to complete- I am so grateful to be living a life that I love. I hope to be able to continue to share this amazing space I live in for as long as I am possibly able too. I can’t imagine a better life.